While visiting the Thorne Rooms exhibit at the Chicago Art Institute, best friends Ruthie and Jack discover a key that transforms their experience from educational to magical. Check out The Sixty-Eight Rooms by Marianne Malone. On a class field trip to the Chicago Art Institute, best friends Ruthie and Jack get their first look at the Thorne Rooms—a collection of 68 miniature rooms built in the 1930’s. Each of the Thorne Rooms shows a different period in history, from the French Revolution to the Salem Witch Hunt. The rooms are crafted to perfection; every detail is precisely measured and constructed to replicate a room that once existed. 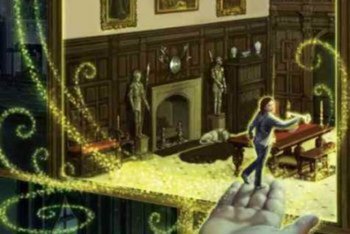 But beyond the elaborate details, Ruthie and Jack discover something even more fascinating about the Thorne Rooms…something magical! When Jack discovers a curious-looking key, the friends wonder what it’s for. They sneak through the door that leads to the back of the Thorne Rooms (where the museum staff go to clean and dust the exhibit). And that’s when they discover the unbelievable power of the key. Meanwhile, Jack’s family is having money problems. His mother is an artist, which means that her income is never steady. She’s behind on her rent, and if she doesn’t come up with it quick, Jack will have to move[/kwlink]. If only there was something Ruthie could do for them. The Sixty-Eight Rooms by Marianne Malone is a great book for young adults. It’s not only a magical adventure, but it’s educational without being preachy. You get a first-hand look some of history’s most fascinating periods. If you’ve read The Sixty-Eight Rooms, let us know how you enjoyed it in our comments section below!